Takes a while to get going and even when it does, turns out to just be okay, with decent action, but a pretty ordinary plot. The action is sometimes pretty cool, but it’s one of the only good things about this movie. Credit that to stunt choreographer Yuen Woo Ping, who has done wonders for martial arts films over the years. Only here, he is only on about half the time, and even that might be a little too generous. There are some clever things going on here, such as a fight between Tiger, our protagonist, and his master, that involves nothing more than a staff. But the central storyline is about an illegal fighting ring, and it feels very familiar and routine. Keanu Reeves is the villain and he plays him with no personality or human rationale at all. In fact all of the characters in this film are weak and the story is definitely something we’ve seen before. Some scenes do work, but for the most part this movie isn’t very good or original. 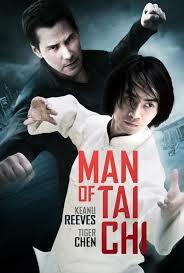 Man of Tai Chi is the directoral debut of Keanu Reeves. Not exactly the guy you’d expect to try at his hand at directing, but I guess every actor whose been kicking around the business over the years wants to try his hand at it sooner or later. Just look at Joseph Gordon Levitt a few years ago with Don Jon, which turned out to be a very funny and smart film. Not so with Man of Tai Chi. What we get here is a movie that feels very familiar and really doesn’t amount to a whole lot. Now, to his credit, Keanu Reeves isn’t going for anything tremendous here. He’s not looking to make some mind-bending thriller, the way a Christopher Nolan would, and he’s also not looking to make a romance or drama or anything about what he is capable of. Instead, Reeves is looking to make an action movie set in the world of Hong Kong. Reeves has built his career on action movies. It is far and away the genre that he knows the most about. From Point Break to Speed to the Matrix to John Wick, this guy is certainly right at home working in this genre. And then there’s the Asian element of the movie. Other than Reeves, there really aren’t any Americans in the film.It goes so far in that direction, that at least half the movie features subtitles. This often feels like a foreign film that Reeves just happens to have a role in. In other words, he’s not trying to compete with American cinema here, he’s trying to compete with Hong Kong martial arts films. Note the main character, Tiger, who trains at a temple, with his master, just like the ways of classis martial arts films like Fist of Legend and Crouching Tiger Hidden Dragon. It should also be noted that Reeves has gotten master action stunt coordinator Yuen Woo Ping to do come up with all of the stunts. Ping has certainly turned out some amazing films in his time, but he’s also turned out plenty of lousy ones. His best work is definitely behind him, with movies like Fist of Legend, Iron Monkey, and Once Upon a Time in China II. But he also had major success with the Matrix movies (where he met Reeves) and the Kill Bill films. Still, Ping seems to be only as good as the material he is given to work with is, and if the movie doesn’t have much going on without him, there’s only so much he can add to the mix. That brings us to this movie about illegal fighting tournaments. It’s certainly a storyline we’ve seen before. 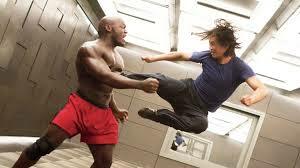 In fact, Tony Jaa made his breaktout with a modern classic about this exact topic, with his movie Ong Bak. Only that film was about a whole underground club and organization. Man of Tai Chi is a little more focussed on single characters. It wants to pretend and seem like its about an underworld, but really it’s about one man, Donaka Mark (Reeves), and the couple of people who work for him. At the start of the movie, we watch a fight in a small room between two men. When the first man defeats the other, an order comes over a P.A. system that has Donaka’s voice saying, “Finish him.” The man who was victorious in the fight refuses to take the life of his helpful victim. That’s when a man dressed all in black, wearing a black mask which covers his entire face, enters the room. He walks right up to the man who is laying on the floor, bends down, and snaps the man’s neck. We follow this man into the next room to see him take off the mask and watch as it is revealed that this is Donaka. So he’s a bad guy. Pretty cool beginning. Especially when in the very next moment, he goes into the locker room to find the man who won the fight and repeatedly stabs this man to death. Now we meet Tiger, a young man in mainland China who trains at a temple with his master. They talk a lot about meditation and finding ones Chi. There’s discussion about balance and attention paid to the Yin and Yang symbol. One could make the argument that this movie pushes too hard to add in things like this, much the same way The Wolverine felt phony in how hard it pushed to throw in terms like Yakuza and Ronin. Still, there are definitely some cool scenes early on, such as a training scene between master and student where the master uses a staff to try and strike Tiger and Tiger must dodge the staff while remaining in place, each foot firmly planted on the parts of the Yin and Yang symbol on the ground. Tiger gets a call about coming to meet with Donaka and he shows up at a building one day, expecting an interview. He thinks he’s applying for a security job, but soon finds out there’s a lot more going on here than he knows about. Once at the building, a man instructs Tiger to get into a car and they drive off to another building. They then walk through this second building only to find an airplane waiting for them in back. They board the plane and fly to Hong Kong. Once they arrive, Tiger walks into a small room, (the same one where the movie began) and is instructed to face different directions. There is a mirror at the far end of the room, and it seems like someone is watching Tiger through the mirror. Then, when he least expects it, a man pops up from behind him, and the order, “fight,” is yelled over the P.A. system. Slowly but surely this movie falls into the trap of going down the same path that these movies always tend to take. That means that Tiger starts to become corrupt in his morals. I’ve seen this in fight films, going all the way back to the Karate Kid part III with Daniel breaking a guy’s nose at a club for talking to his girlfriend. Here, it happens in a legal tournament back in mainland China, where fighters are expected to use judgement and follow the rules. Tiger throws those rules out the window and is disqualified for what he does to his opponent. The story continues to go on this very familliar path after that, and end with one of the dumbest moments of all, bringing our two leads together for a final fight in a way that would never happen. Let’s just say one character shows up somewhere that he would been sure to steer clear of if this movie had any logical or realistic merit. Instead, it is simply an illegal fighting tournament movie with some occasionally decent choreography. Nothing more, nothing less. Some of the fights are interesting, like one where Tiger is thrown on stage at a high end night club and forced to fight two different guys at once. But for te most part, this movie is pretty routine. Reeves is clearly a fan of the Mortal Kombat games, using lingo like “Finish Him,” and “Fight” to issue demands at different parts of the tournaments. I do like the idea of using our usual hero actor, Reeves, for a villainous role, but there just no realism or humanity or beleivability to any of the characters. There were definitely some positive qualities to this movie, and the action was more enjoyable than it is in most films, but the storyline and characters really held the film back. For Reeves, this movie falls somewhere in between his films The 47 Ronin and John Wick, both from the last few years. Wick is the standout film, being far better than it ever should have been. 47 Ronin is the lousiest of the bunch, relying on CGI effects more than anything else. Man of Tai Chi is deinitely right, smack, in the middle.